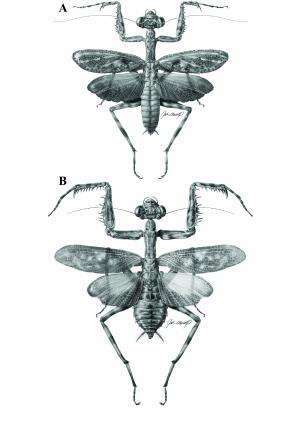 A scientist has discovered 19 new species of praying mantis from Central and South America. 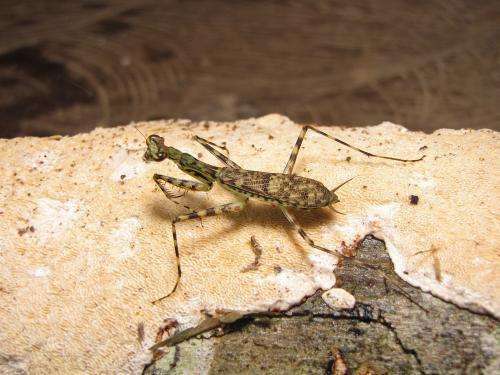 The new species of bark mantises were discovered in tropical forests and also found among existing museum collections. Dr. Gavin Svenson, curator of invertebrate zoology at The Cleveland Museum of Natural History, described the new species and published a revision of the genus Liturgusa in the open access journal ZooKeys. Svenson collected the insects from eight countries in Central and South America, as well as gathered hundreds of specimens from 25 international museums in North America, South America and Europe. Many of the newly described species are known only from a few specimens collected before 1950 from locations that are now heavily impacted by agriculture or development. "This group, the Neotropical bark mantises, are incredibly fast runners that live on the trunks and branches of trees," said Svenson of The Cleveland Museum of Natural History. "This violates the common perception of praying mantises being slow and methodical hunters." Like most praying mantises, they are highly camouflage. However, this group is flattened in appearance and is very difficult to locate because of their adept mimicry of bark, moss and lichen. They often evade discovery by running to the opposite side of the tree before being noticed, an escape tactic also seen in many tree dwelling lizards. "This is an amazing behavior for an insect because it shows that they are not only relying on camouflage like most insects but are constantly monitoring their environment and taking action to run and hide," said Svenson. "In addition, some species leap off the tree trunk to avoid capture and play dead after fluttering down to the forest floor since none of the species are strong fliers." As highly visual predators, the bark mantis species appear to be active hunters that pursue prey as opposed to ambush hunters that wait for prey to come close. 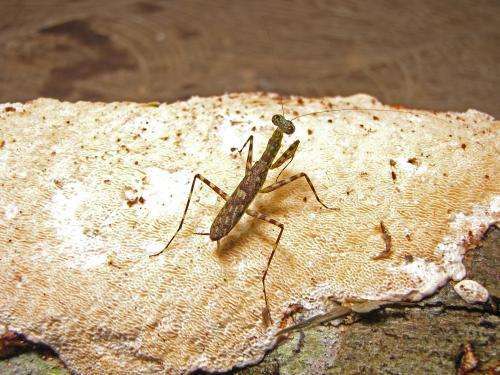 Also, like a similar bark mantis group from Australia (Ciulfina), this Neotropical group does not appear to exhibit cannibalism, which is an often misunderstood characteristic exhibited by some praying mantis species. The research brings to light a previously unknown diversity of bark mantises. It indicates that there are many more species to discover. "Based on this study, we can predict that mantis groups with similar habitat specialization in Africa, Asia and Australia will also be far more diverse than what is currently known," said Svenson. "Many of these groups have never been studied other than by the scientists that originally described some of the species, which in some cases is more than 100 years ago. This is exciting because enormous potential exists for advancing our understanding of praying mantis diversity just by looking within our existing museum collections and conducting a few field expeditions." The discovery of these 19 new species triples the diversity of the group that scientists thought had only a few species with broad geographical ranges. The research indicates that most species are far more restricted in their locations within regions of Central and South America. This increased diversity and better measure of distribution has broad implications for conservation since many of the species were found in or near natural areas that may or may not be protected. The conservation status of some of the new mantises found in museum collections is not known since they have not been seen since originally collected in the early 1900s and could be highly threatened or even extinct. Among the new species, Liturgusa algorei, is named for Albert Arnold "Al" Gore Jr., former vice president of the United States of America, to honor his environmental activism and efforts to raise public awareness of global climate change. Liturgusa krattorum is named for Martin and Chris Kratt, hosts and creators of Kratts' Creatures and Wild Kratts, both of which provide children with entertaining and accurate programming on animal biology. Liturgusa fossetti is named in honor of the late James Stephen Fossett for his inspirational dedication to exploration. Liturgusa bororum is named for the Bora people, a group of people native to parts of the Amazon basin in northern Peru, Columbia and Brazil. Liturgusa tessae is named for Svenson's daughter, Tessa. Liturgusa zoae is named for Svenson's daughter, Zoey. Svenson's research is focused on the evolutionary patterns of relationship, distribution and complex features of praying mantises. His current research project aims to align new sources of relationship evidence (DNA sequence data) with morphology and other features to create a new and accurate classification system for praying mantises that reflects true evolutionary relationships.